Consumer Advisory - MediEn Malaysia, Philips Respironics Authorized Distributor in Malaysia, Philips Portable Oxygen Concentrator Machine supplier,Trilogy Ventilator,Dreamstation CPAP,BIPAP,Mask.Malaysia Oxygen,Philips Malaysia authorised service center,Oxygen Malaysia CPAP. We are the authorized distributor and importer for Philips Respironic products. Having full endorsement from Philips as the authorized medical device distributor and importer as well as our longstanding relationship with Philips allows us to offer our clients the best healthcare solution. We embrace a patient-centered approach to provide genuine and verified medical devices, with state-of-the-art diagnostic and treatment capabilities. At Medien, we ensure that every product distributed fulfills local & international safety standards. Our operation and distribution are run according to the Good Distribution Practice for Medical Device (GDPMD). 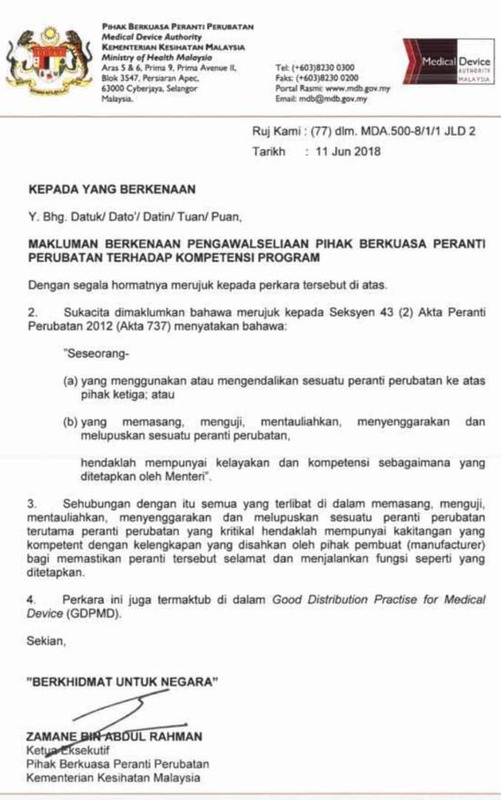 To comply with Malaysian medical device regulatory requirements, as stipulated in Medical Device Act 2012 (Act 737), establishment in Malaysia dealing with medical device must attain GDPMD status to demonstrate its ability to maintain safety and performance of medical devices throughout the supply-chain. It is our privilege to serve the Malaysian communities we call home. Therefore, we strive to go beyond than just selling and setting up medical devices for our clients. The scale of our business also means that we have the abilities and full endorsement from Philips Respironics as the authorized service center. For instance, our engineers who go through rigorous trainings are able to provide high quality maintenance services for your medical devices. We enjoy the opportunity to partner with you in the care of you and your loved one. Therefore, we are committed to bring healthcare to your doorstep and to make healthcare accessible to you and your family.